We can define our own validation logic (custom validation) in struts 2 by implementing the Validateable interface in the action class. The workflow interceptor is used to get information about the error messages defined in the action class. The workflow interceptor checks if there is any validation errors or not. It doesn't perform any validation. It is applied when action class implements the Validateable interface. The input is the default parameter for this interceptor that determines the result to be invoked for the action or field error. It is found in the defaultStack so we don't need to define it explicitly. There is only 1 parameter defined for workflow interceptor. inputResultName specifies the result name to be returned if field error or action error is found. It is set to input bydefault. 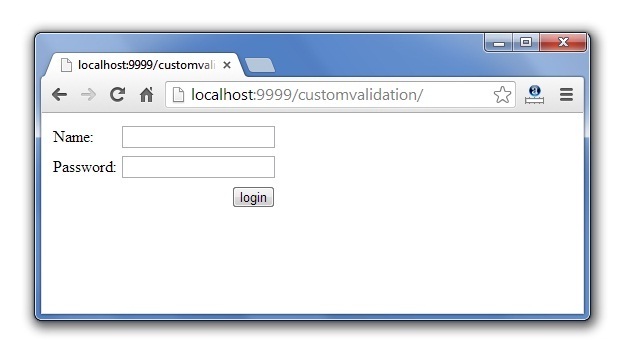 The ValidationAware interface can accept the field level or action class level error messages. The field level messages are kept in Map and Action class level messages are kept in collection. It should be implemented by the action class to add any error message. void addFieldError(String fieldName,String errorMessage) adds the error message for the specified field. void addActionError(String errorMessage) adds an Action-level error message for this action. void addActionMessage(String message) adds an Action-level message for this action. void setFieldErrors(Map<String,List<String>> map) sets a collection of error messages for fields. void setActionErrors(Collection<String> errorMessages) sets a collection of error messages for this action. void setActionMessages(Collection<String> messages) sets a collection of messages for this action. boolean hasErrors() checks if there are any field or action errors. boolean hasFieldErrors() checks if there are any field errors. boolean hasActionErrors() checks if there are any Action-level error messages. boolean hasActionMessages() checks if there are any Action-level messages. Map<String,List<String>> getFieldErrors() returns all the field level error messages. Collection<String> getActionErrors() returns all the Action-level error messages. Collection<String> getActionMessages() returns all the Action-level messages. Note: ActionSupport class implements Validateable and ValidationAware interfaces, so we can inherit the ActionSupport class to define the validation logic and error messages. index.jsp for input from the user. 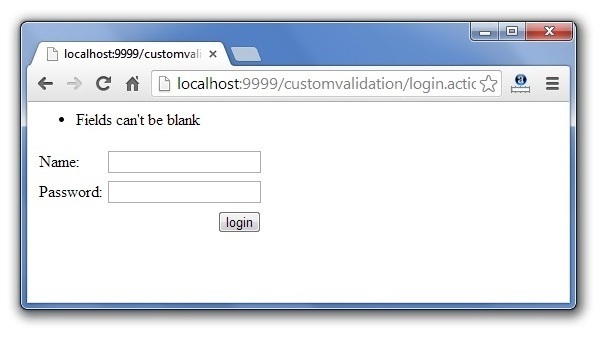 RegisterAction.java for defining the validation logic. welcome.jsp for the view component. 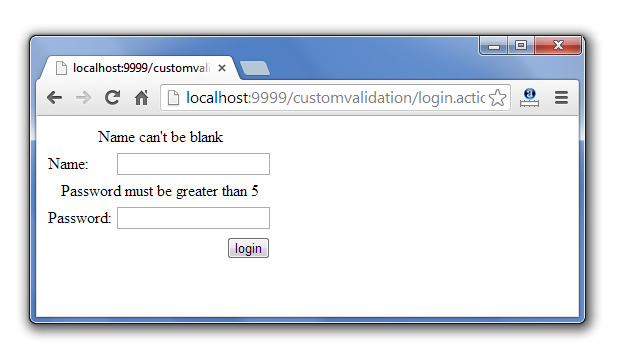 This action class inherits the ActionSupport class and overrides the validate method to define the validation logic. This xml file defines an extra result by the name input, that will be invoked if any error message is found in the action class. Now you need to use actionerror tag in index.jsp file to display the action level error message.